AUTOMATED sample management has often been thought of as the preserve of the larger better-equipped laboratory, but TTP Labtech says this is no longer the case. Its new Arktic biobank stores up to 95,000 individual samples in 0.5ml tubes at between -20C and -80C, but requires only a small laboratory footprint. This low-cost unit, the company says, is therefore ideal for space-restricted laboratories. Arktic promises secure sample tracking and automated sample retrieval, delivering cherry-picked tubes from the store in under a minute. Compared to hand-picking, it says, this reduces instances of lost samples and provides increased confidence in sample integrity. 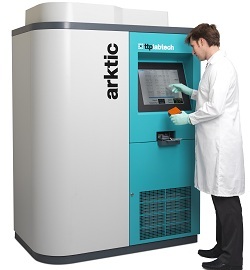 TTP Labtech has introduced Arktic to expand its range of biobanking sample storage technologies, augmenting its existing Compound -20C modular sample storage system.